About a year ago my wife came to me in a frantic state, she had a client meeting on a Saturday morning and the dress she wanted to wear was dirty, and on top of that she needed to get to bed to be up on time. So looking to spare her of some stress I agreed to stay up late and make sure the dress made it through the wash and dry process, and ended up in our room. So with a quiet house, a TV to myself, and a bedtime to be dictated by a washer and dryer I set out to find something new to watch on Netflix. I figured it was finally time to break away from my wife’s picks of lighthearted British dramas and return to my own sci-fi roots, but the question was what to watch? It was at that point I ran past Star Trek: Enterprise and my question was quickly answered. I had been eyeing up Enterprise since I had first spotted it up on Netflix a few months before that, but I never really found the time to put the series on. The concept of Enterprise had always interested me, but I never gave the show enough time to grow on me when it was still on the air years before. After all when Enterprise came out we had seen nearly 14 years of non-stop Star Trek shows beginning with The Next Generation in 1987, so the show at that point seemed to be white noise. Of course I will have to say that I was wrong, and Enterprise really surprised me that evening nearly getting me to bed as the sun just about came up. From that point on I was hooked and watched all the Star Trek shows in reverse airing order moving from Enterprise, to Voyager, to DS9, to TNG, to TAS, and finally to TOS. I took pride and nostalgia in the episodes of each I remembered, and sat riveted by the episodes and seasons I hadn’t seen especially during my college years. 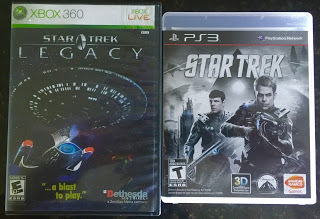 But in watching those shows it moved from mid-Summer of 2015 to late Spring of 2016 and right into the 50th year of Star Trek being the cultural phenomenon, and bedrock it is.Running a video game blog I decided to due my part and pay homage to Star Trek via my existing large collection of Star Trek games I’ve had since I was a kid, as well as finding out what other titles are out there that I may have missed or been unaware of over the years, and adding them to my collection. 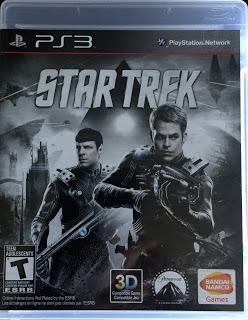 To say the least Star Trek has been extremely prolific in the world of video games, and despite what you may have heard there are actually many excellent titles out there on a lot of different systems. As the title to the post might suggest, I am here to talk about Star Trek’s 50th anniversary, and with that said I have two games that can help you celebrate the 50th in game form without looking very far. 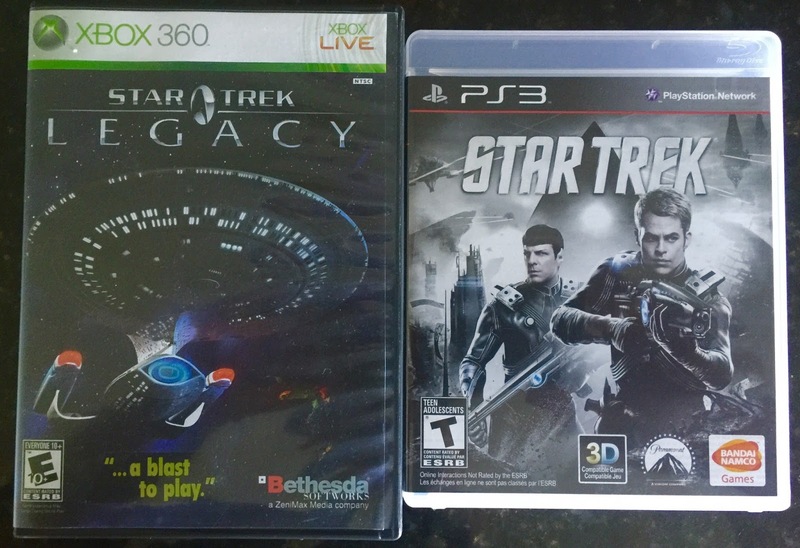 I present to you Star Trek: Legacy, and Star Trek. 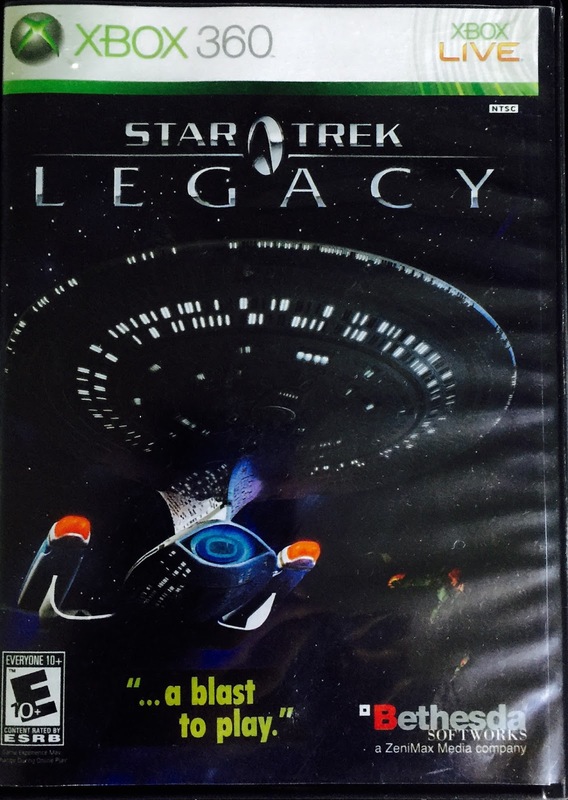 Star Trek: Legacy (Xbox 360, PC)- Legacy is a phenomenal game that takes you from Enterprise all the way to a period of time slightly after Nemesis in which we have Admiral Janeway and Captian Picard working together in culminating battle. 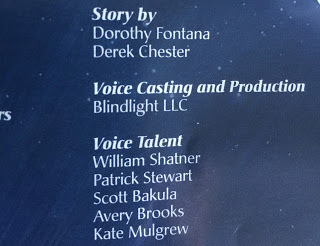 Yes, the voice talent of the actual captains!! 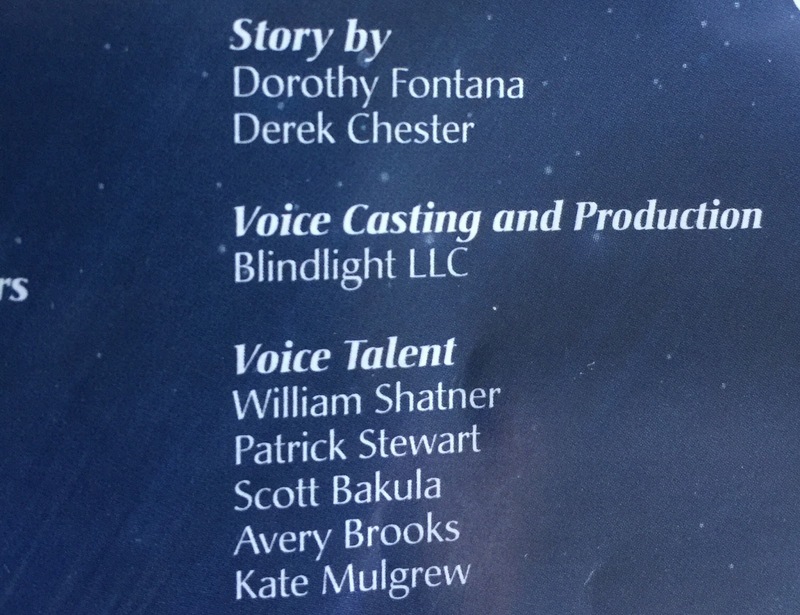 And story by Dorothy “D.C.” Fontana!! The main story mode of this game is actually pretty intriguing and works well carrying you from one generation to the next over the 221 year period the game takes place in. The central plot follows the five captains and their dealings with a mysterious time traveling Romulan named T’Uerell who has Borg ties, and is constantly trying to build weapons of mass destruction. In true Star Trek fashion the fortitude of each captain and their crews thwart T’Uerell in her goals, ending in a final battle involving both Voyager and the Enterprise-E as well as a allied fleet of other vessels. Along the way you are given the opportunity to visit and control NX-01 Enterprise, the Enterprise, the Enterprise-A, the Stargazer, the Defiant, the Enterprise-D, Voyager, and the Enterprise-E, plus you get to spend a little time at DS9. So why is this game a 50th Anniversary must? 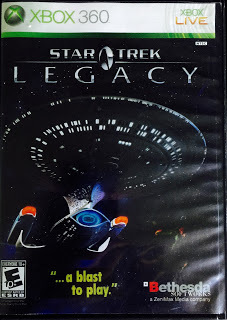 Considering this game covers TOS (and assumably TAS), TNG, DS9, Voyager, and Enterprise plus delves into both the TOS and TNG films, all while voiced by the actual captains, giving you a shot at controlling the ships that have defined the franchise, and a story line written by one of Star Treks best writers, I don’t think there is any better way to celebrate Star Treks 50th Anniversary in the form of a game. Kind of an everything in one spot. I guess I should call this either Star Trek (09′) or Star Trek: Kalvin Timeline, but its just known as Star Trek and I don’t think there has been a video game simply called Star Trek since the 70’s. Anyway, despite what you might think this game is actually an adventure of its own, and isn’t directly based on any of movies in the Kalvin Timeline. In this particular game we join the Enterprise and the Kalvin Timeline crew, yes all voiced by the actual actors from the films, for an encounter with our favorite marvelous reptile enemy the Gorn, who no doubt you remember from that classic TOS episode Arena. The game itself is a third person shooter, meaning your always behind whatever character your playing as, which can be Spock or Kirk. I personally think that its not all that bad of a game, although it is relatively obscure thanks to not getting a lot of love from critics when it came out. With that said its also easy to come by with the PS3 version being cheaper to get than the Xbox 360 version, and going for less than $10 with shipping on eBay. I as a Star Trek fan, know the Kalvin Timeline movies don’t get as much love as they should. I will agree that J.J. Abrams decision to create an alternate timeline is somewhat questionable, but as far as the films go their not all that bad. Star Trek: Beyond most recently seemed to gain a lot of “street cred” with long time fans, thanks to its numerous Easter Eggs tying it into the various series, as well as it’s overall plot which had very true Star Trek feel. But, with that said as a Star Trek fan, I don’t think 09′ or Into Darkness aren’t without their merits as well, as controversial as that may be to say. This game so far is the only one I am aware of that takes place in the Kalvin Timeline, and being that the game doesn’t mimic a film but rather takes us on a different journey I think its a great way to connect with the Kalvin Timeline and even celebrate the three movies taking place in it. Essentially this game, Star Trek, as far as games goes brings the Kalvin Timeline into the fold. Together Star Trek (XBox 360, PS3) and Star Trek: Legacy (XBox 360, PC) run the full gambit of Star Trek‘s 50 years, within game form. Both games shoot for a connection to the series and/or movies that have made up the past 50 years by giving us the actual captains, and not just voice actors. On top of that the ships themselves, characters, and alien races are also carefully detailed so that fans can connect with the games a little more, without having to deal with the generics we sometimes see in games, and have seen from time to time in Star Trek games. Of course playing these two games may not be on par with sitting down and binge watching all 6 series, and 13 movies, but as a fan and gamer you may appreciate being part of the action. I would like to give a special thanks to YouTuber CatsRock2100 for his video of Star Trek:Legacy mission one gameplay I have attached above, please feel free to visit his channel and other “lets play” videos many Star Trek game based.